I have been with Madame Bize-Leroy on walks through her vineyards and it is an incredible experience. It is like watching a mother among her children–she ignores me most of the time and goes quickly in high heels through different rows, tending to vines, pulling leaves that are shading some of the ripening grapes, adjusting clips that tidy the growing canes, which are never trimmed like in most vineyards. I am just trying to keep up with her pace and her eyes, which dart from vine to vine, noticing each small leaf or clip out of place. One can see easily why she might be out of place in a tightly-knit conservative region like Burgundy. She follows no one, trusts her instincts, and pioneers her own way of coaxing the most from her vines. The 2015 wines from Domaine Leroy are nothing short of magnificent. Some of the wines nearly brought tears to my eyes, especially the fine, distinguished Musigny, the effervescent Romanée-Saint-Vivant and the majestic Chambertin. 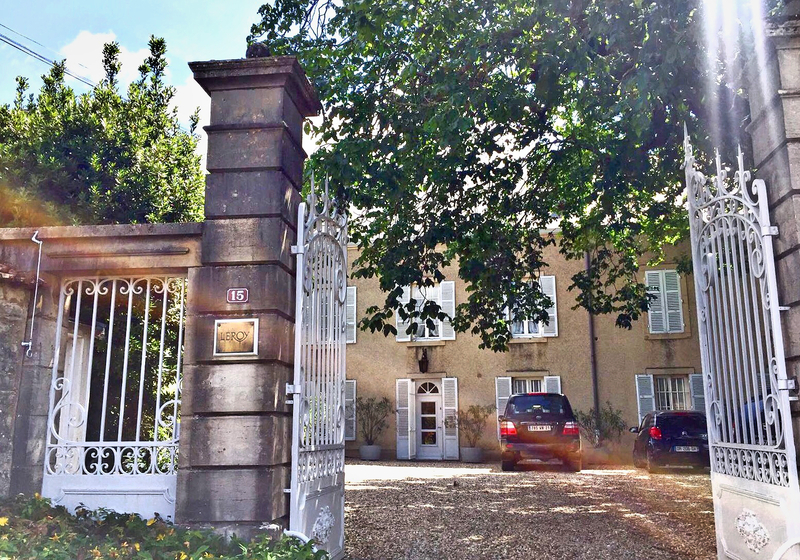 According to Madame Lalou Bize-Leroy, the owner and guardian of Domaine Leroy, 2015 was a magnificent year. Tasting the 2015s recently at her domaine in Vosne-Romanée, as six month-old bottled wines, I have to concur wholeheartedly. Where is evidence of the heat and the drought during the summer months? I couldn’t find any while tasting through her village wines then progressing to the premier and grand cru reds. The wines are fresh, precise with lovely purity of flavors. At Domaine Leroy, the entire 22-hectare vineyard was harvested within 12 days from the 3rd of September to the 15th of September. It was an early harvest but not an unusual one. Alcohol levels are moderate for all the wines – between 13% and 13.5% and there is no sign of excessive fruit, over-ripeness or jammy characters in any of the wines. There is freshness, focus and a wonderful approachability in this vintage. The 2015 vintage for Domaine Leroy is undoubtedly sensual and filled with sweet, ripe flavors. It is a more open vintage than the previous four vintages that came before it. Despite only being bottled for six months, the wines were beautifully expressive and open. I was riveted by the glorious Romanée-Saint-Vivant and stunned by the majestic Chambertin, which can sometimes be austere and closed in its youth. This magnificent Chambertin nearly brought tears to my eyes. The wine has depth, stature, and an incredible presence on the palate. There is focused minerality, dark berries and savory herbs and earth that mingle on palate. Despite the power and generosity of this wine, there is finesse and the finish of a great Burgundy. The wine is complete, incredibly complex, with a persistent finish. Magnificent! Only 2 barrels made in 2015. This is as close to a perfect Romanée-St-Vivant as one can get. The texture is silky and sumptuous, the nose beguiling and the palate filled with complex layers of flavors that linger for what seems like several minutes. Gorgeous nose of rose petals and violets opens up to a palate that is powerful yet elegant with incredible finesse and length. This is a powerful Musigny that has wonderful tension and fine, detailed flavors. Best after 2030. This powerful, yet silent wine (not that expressive on the nose right now), is a wine built for long aging. The palate is graceful yet powerful with incredilbe finesse and layers of delicate minerals. There is a completeness, a harmony and elegance despite its power along with amazing depth and complex flavors. A spiritual wine that will encourage people to ponder the meaning of life and admire life’s beauty (like this wine). This Clos de la Roche is slightly closed on the nose (after 6 months in bottle). The palate is extremely powerful however, with layers of minerals, savory herbs and granite of great intensity and depth. A complex, layered and powerful Clos de la Roche that will evolve and improve for at least 30-40 years if not more. A structured, minerally powerful red that requires patience – wait at least 15 years before approaching. An extremely fine Musigny with grace, power and finesse. This is one of Leroy’s magical wines, consistently powerful yet elegant. In this ripe vintage, the wine is generous and forceful without trying with gentle layers of flavors – sweet wild flowers, minerals, red berries and then earth, spices and herbs. The wine changes in the glass and dances on the palate. A graceful wine with silky firm tannins that has amazing complexity, balance and finesse. Lovely, long finish. This is a fabulous Musigny with a long future. This is a magnificent Richebourg – structured, majestic, complex and deep. The palate is powerful and filled with savory herbs, spices, sweet mixed berries, earth and mminerals. There is a density here but without any heaviness. The finish is layered, persistent and incredibly long. A wine that will evolve and improve over the next 30-40 years. A gorgeous Vosne Brulée that is truly impressive. The palate is complex, powerful, intense – filled with mixed red flowers, dark berries, minerals and savory herbs. This is a powerful red Burgundy with great detail and finesse. The floral, sweet finish is very long. This vineyard was harvested on September 5th. This is the most impressive rendition of Chambolle Charmes that I have tasted. It has everything that you might want in a top premier cru Chambolle – incredible delicacy, a fine gentle character and wonderful purity of flavors. An alluring nose of florals, such as roses and jasmine leads to a serious, layered palate of wild raspberries, sweet spices and minerals. The finish is extremely long. This wine holds the essence of the charm of Chambolle – seductive and unforgettable. An extraordinary Corton with great minerally depth and amazing length. Powerful red that is tightly wound, with savory, earthy flavors that exudes power without being too dense or overt. Watch this intense, layered Corton become a beauty as it evolves in bottle over the next 20-40 years. Sadly, only 2 barrels of this Corton was produced in 2015. In comparison, in 2016, 4 barrels were made from half a hectare. This powerful Vosne Beaux Monts is a profoundly serious wine. The palate offers a huge range of flavors that span the herbal, spice and dark berry fruit spectrums. There is depth in the sweet, generous flavors with firm, ripe tannins and a wonderful freshness to complement it. A wine built for aging – there is potential for this wine to become much grander and gain in stature over the coming decades. Best after 2030. To read all the tasting notes of Domaine Leroy’s 2015 wines, click here.